iTunes is a powerful audio player that supports a variety of formats, including the space-saving MP3 and AAC, the uncompressed AIFF and WAV, and the proprietary Apple Lossless. But as you explore the Internet, you’ll come across other file formats with names such as FLAC, SHN, Monkey’s Audio, Ogg Vorbis, and so on (for a list of common formats and their file extensions, see “A Plethora of Formats”). While you can’t play these files with iTunes (at least not out of the box) other programs will let you play such files. Or you can convert them to iTunes-friendly formats; after doing so, you can add them to your iTunes library then listen to them on your iPod or iPhone. 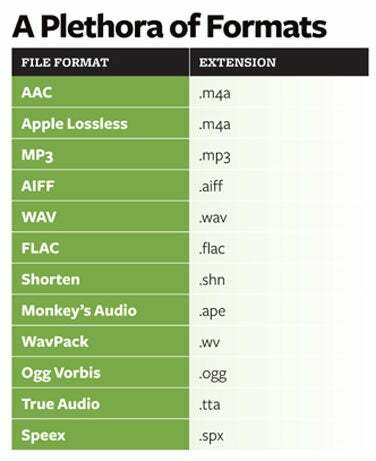 Here’s how to work with other audio formats you may come across. Here are some of the formats you're likely to come across. As previously mentioned, lossless compression doesn’t toss away any musical information (as compressed MP3 or AAC files do). When you play lossless files, they sound exactly like the original uncompressed files from which they were made. But that quality has a price: lossless files are much larger than AAC or MP3 files, usually about five times the size of their compressed cousins. For example, a 128-Kbps AAC or MP3 file of a four-minute song takes up about 3.7MB of space, whereas a FLAC file of the same length weighs in at 15MB to 25MB, depending on the density of the music. You may also come across formats called WavPack and Monkey’s Audio. And a popular open-source lossy compression format is Ogg Vorbis. Since iTunes can’t natively play FLAC, SHN, and Ogg Vorbis files, you’ll need some tools to listen to them. If you want to hear FLAC files, Cubic Fruit Design’s free Fluke is an AppleScript that uses three pieces to software to let you import and listen to FLAC files in iTunes (but you still won’t be able to add the FLACs to your iPod). Just open the files with Fluke, then let the program go to work; it adds the files to your iTunes library in a few seconds. Unfortunately, Fluke is pretty buggy, but it’s good when it works. With the free Play, you can listen to FLAC files without having to convert them to another format first. 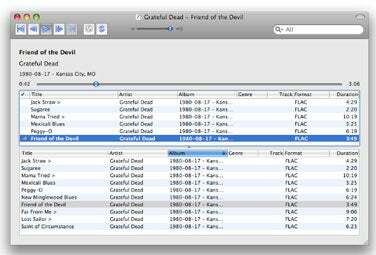 If you don’t want to add FLAC files to your iTunes library or if you want to play other file formats, several programs can help. Stephen Booth’s free Play 0.3 and Vincent Spader’s free Cog 0.07 are excellent choices. They support playback of FLAC, Ogg Vorbis, WavPack, Monkey’s Audio, and many formats supported by OS X’s Core Audio (AAC, MP3, Apple Lossless, and so on). Both support gapless playback for concerts, and Play adds the ability to create a library with playlists and smart playlists. Players are useful if you’re in front of your Mac, but you’ll probably want to add audio files to your iTunes library so you can transfer them to your iPod or iPhone. The iPod currently supports only AAC, MP3, WAV, AIFF, and—on all models except the shuffle—Apple Lossless, so if you have FLAC, SHN, or Ogg Vorbis files, you must convert them. Fortunately, some good, free tools are available. 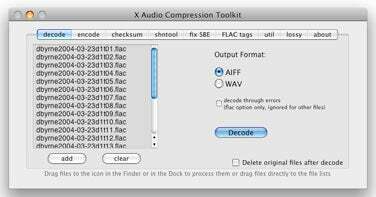 Scott Brown’s X Audio Compression Toolkit (aka xACT) 1.64 can convert SHN, FLAC, Monkey’s Audio, and other files into WAV or AIFF files—after which you must convert them to another format (unless you plan to use the uncompressed files). To convert them further, add the files to your iTunes library, select them, then choose Advanced: Convert Selection to yourselectedfileformat. xACT can also encode FLAC, SHN, Monkey’s Audio, and WavPack files from your CDs. It can even encode MP3 files using the open-source LAME MP3 encoder. Stephen Booth’s free Max 0.8.1 (Max 0.7.1, ), goes a bit further, converting files directly into any QuickTime-supported file format (AAC, MP3, or Apple Lossless, for example), saving you the extra step. It can convert to and from many formats, letting you deal with almost any audio files you encounter. You can also use it to rip CDs, to tag files, and more. As a graphical user interface for several Unix applications, xACT makes it easy to convert audio between many different formats. Another free tool, TMKK’s XLD or X Lossless Decoder, is a cornucopia of audio tools. While it handles fewer file formats than Max does, it has one big feature that other such programs lack: it can exploit cue sheets—texts files that record information about the beginnings and ends of tracks for albums ripped as a single file. Cue sheets are used to avoid gaps inherent in MP3 files (iTunes and the iPod now support gapless playback, but not all hardware and software do). Pristine Classical, for example, sells its MP3s as single files, because the small gap at the start and end of MP3s “can result in highly irritating breaks in continuous music.” To split a file with a cue sheet, open the .cue file in XLD, select the appropriate music file, then click on Decode; XLD will split or decode the file according to the preferences you have set for its output format. Finally, if you own the aforementioned Toast 9, you can use it to convert the FLAC or Ogg Vorbis files it supports. Launch Toast and click on the Convert button in the toolbar (the last of the five buttons). Then click on Audio Files option underneath the Convert heading, then drag the files you want to convert into the main window. Click on the big red button at the bottom of the window, and then select a file format in the dialog box that appears. Click on Options to select bit rate and other settings, then select a folder where you want to save the converted files and click on Choose (Toast will save these preferences for the next time you convert files).